This guest post is by the Zach Rocheleau from "The Flexible Dieting Lifestyle". While Zach's audience primarily focuses on crossfit and bodybuilding more so than endurance, many of his principles could apply to you as an endurance athlete. Many triathletes think that just because they swim/bike/run a lot, they can just eat as many calories as they want, but the result of this for many heavy cardio athletes, is that they end up gaining unwanted body fat. 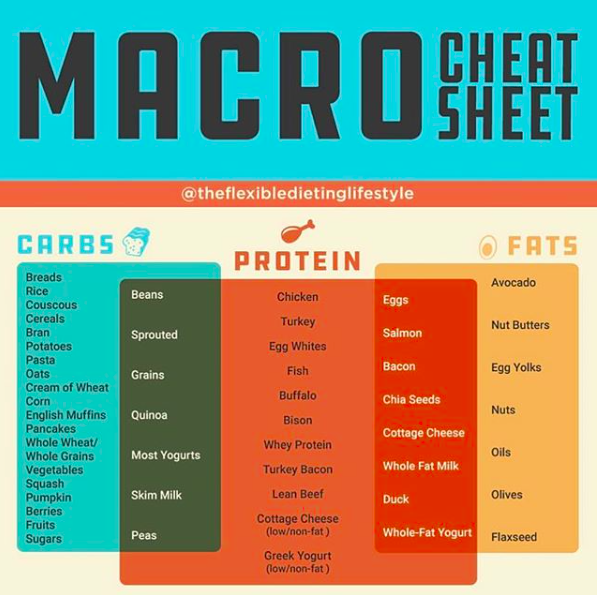 Understanding the basics of Macro's can help you develop strong eating habits so you can get the lean body you deserve from all the training you put in. Read below to see what Zach has to say about his Macro Cheat Sheet. "Every athlete should have specific nutrient goals. For most athletes, they should have a specific goal of hitting a target number in grams of protein, carbohydrates, and fat. These are called Macronutrients. For most athletes when they first start tracking macronutrients, they have a hard time consistently hitting the right numbers. It's not the athlete's fault, it just requires a bit of practice and understanding the basics. So I took it upon myself to to create a simple cheat sheet displaying which foods provide which macronutrients. As you can see in the chart, some foods provide solely one Macronutrient, while others provide a combination of more than one macronutrient. I really help this chart helps you understand macronutrients at the most basic level. I am always available to answer questions. Also, if you would like to read more about how I track macro's, go to FlexibleDietingLifestyle.com/HowToFlexibleDieting.